Standing on an overhead bridge in Ramadi on Iraq's main highway to Baghdad just over a year ago, I witnessed the extraordinary sight of about half a million people gathered — as they did every Friday — to peacefully protest the sectarian policies of Iraqi Prime Minister Nouri Al Maliki. There were chants and speeches by local Sunni politicians and religious leaders, and from leaders of other provinces and sects across Iraq, including Shia clerics, but little response from Baghdad and virtually no western media coverage. The protesters, led by tribal elders from the western Anbar province, resisted the call to violence made by bands of Islamist fighters (ISIS) who were circling in the desert around the protest camp and planting car bombs in Baghdad. Instead, the tribal leaders insisted on putting their objections in writing and continuing nonviolent protest to draw attention to their plight, with the aim of engaging the Iraqi Government in dialogue. 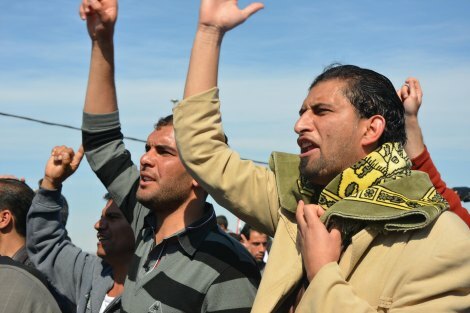 After more than 12 months of peaceful protest in Anbar and other cities, the Government still refused to negotiate on key demands and rather harassed, arrested, attacked or even killed protesters. In December Iraqi security forces were sent to sack and dismantle the camp. Protest moved to armed resistance; the bombing of Fallujah followed, causing hundreds of civilian deaths, a new wave of refugees and widespread destruction. The response to Maliki's aggressive sectarian rule was, inevitably, an aggressive sectarian response. ISIS has been quick to exploit the divisions and piggyback on the Sunni uprising, extending its violence to northern Iraq. It is Iraq's Sunni tribes and militias — who hold little in common with ISIS and reject its extreme ideology — who could withhold the Islamists' march to Baghdad, should they have the motivation to do so. Understanding the context of today's turmoil is the key to any de-escalation of violence and a guide to the type of assistance foreign nations can bring. Those who have been watching Iraq the last 11 years have not been surprised by the past week's events. 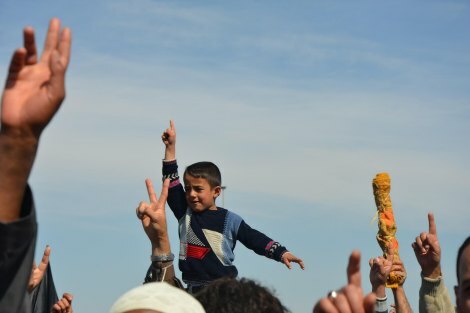 They point to disastrous 'divide and conquer' policy blunders by occupation forces in Iraq; the nature of the invasion and occupation itself; and support of the Maliki regime, despite its discriminatory policies, human rights violations, and violence against its own citizens, as the foundation for today's mess. Removing Maliki, who did not receive the majority of seats in recent elections, could be the first step in a unification process that could ease tensions and quash the goals of ISIS insurgents. Foreign military intervention, by either Tehran or Washington, would draw in other regional players and escalate violence. The attention on the deteriorating situation in Iraq and talk of possible Western intervention has provided a catalyst for renewed reflection about Australia's role in the 2003 invasion. It has also raised questions about Australia's decision-making process should the Abbott Government choose to intervene again. It has prompted speeches in the Parliament this week by independent MP Andrew Wilkie calling for a royal commission into the Iraq War, and Greens MP Adam Bandt reintroducing a Greens 'war powers' bill requiring parliamentary approval to deploy Australian troops overseas. Such calls have also been made by the Campaign for an Iraq War Inquiry (CIWI), of which I am a member, to ensure lessons are learnt from Australia's role in the 2003 invasion of Iraq. The group, made up of prominent Australians, including former prime minister Malcolm Fraser, this week called for parliamentary debate before any Australian involvement in further military attacks on Iraq. CIWI President and former Defence Department head Paul Barratt said the fact that the Government is considering going back into Iraq makes it all the more obvious that we need to learn the lessons from the previous invasion. 'There should be a royal commission into the process by which we went to war in 2003, with commissioners appointed by a bi-partisan process,' he said. Labor and Coalition governments have refused to hold an inquiry into Australia's participation in the earlier invasion of Iraq. US President Obama has said that he would consult Congress about the possibility of strikes against Iraq, but while our Prime Minister Abbott has indicated that Australia would be ready to help the US, he has not mentioned any role for Australia's elected representatives, the parliament. Iraq needs a local political solution, not another foreign military intervention, and there can be no moving forward until the mistakes of the past are acknowledged and addressed. This requires political work not just by Iraqi leaders, but by the nations of the 'Coalition of the Willing', who were too quick to jump into the invasion and occupation, and too slow to respond constructively to its disastrous legacy. Donna Mulhearn is a freelance journalist and peace activist. Follow Donna on Twitter or visit her website. Thank you Donna for such an insightful and reasonable call for holding back on further military action and reminding us that we still do not have parliament approval for deployment of our troops overseas. I support the call for an independent inquiry into why John Howard alone could take Australia to war in Iraq in 2003 when everyone knew that the evidence was totally inadequate. I am a member of CIWI, and I support Donna Mulhearn's arguments here, based on her great local expertise in Iraq. It is a great irony that the Shia majority, oppressed by Sunni militarists for so many years under Saddan Hussein, allowed Maliki to do the same to the Sunni when the tables were turned by the long US occupation. Now, the two communities just have to work out a fair power sharing deal; or, if they cannot, peacefully partition the country. In any case, western military power shouldn't be used in Iraq again - no aerial bombings, no drone attacks, no covertly deployed special forces on the ground to collect intelligence and direct attacks. It is not our war and we just make it worse the more we interfere. Donna, whilst I have the greatest respect for you and organisations like CIWI, I always falter on the use of the word "peace" in relation to the Middle East, because a large proportion of its inhabitants seem hell bent on exterminating each other. The situation in Iraq seems worse now that the theocracy in Tehran has sent Qassem Soleimani, the Head of its Quds Force, to mastermind the resistance to ISIS. I hold no brief for the latter organisation, but, believe me, Soleimani is as bad as anyone they have: he has been sanctioned by both the UN and USA and declared a terrorist by the latter. The Sunni and Shia seem hell bent on re-fighting battles long gone despite attempts from within Islam to bring them together. The Kurds have all but gotten their independent Kurdistan. I think Iraq, like the former Yugoslavia, another artificial state, is going to break up. If so I hope there can be peace, with some mutual suspicion, between Sunni, Shia and Kurds (the latter mainly Sunni but Kurds first). Sykes-Picot is now finally dead. Barack Obama is, I think, far wiser than our PM and I doubt America will involve itself to any great extent. Thank you Edward for some sense. Iraq should now be engineered actively into its 3 constituent parts, whether fully independent or in a federation. The focus then can be squarely on manoeuvering the moderate tribal leaders into power in the Arab Sunni third; if that needs some active intervention then it would be worth it for those focused "end-game" goals. The sectarian conflicts in Iraq and elsewhere, like the Catholic /Protestant conflicts of earlier times, need two things. Fundamentally what is needed is a realisation that God's call is constant and universal, and that the different forms of response are distorted; limited by the culture and degree of development of the individuals and communities involved. Secondly, time is needed for the hurts and prejudices to die away, so that we can think more clearly and fairly .We will then be in a position to reconcile our differences and cooperate for the benefit of all, in a more spiritual, enlightened and compassionate manner. Till then we can but work at it and pray. It is no wonder they used "divide and conquer" in Iraq. It seems to be a principle that conservative Western governments everywhere have become addicted to over the last twenty years. (I suspect the American conservatives thought it up, and of course all conservatives everywhere are genetically obligated to copy anything the Americans do.) The governments that pioneered this in Iraq use it on their own citizens too - just in a less lethal way - by singling out groups the majority can learn to fear or hate, and then they stoke up the fire under the cauldron. It is certainly electorally successful, as it wins over a certain type of voter, and with the Murdoch press fanning the flames world-wide, and appealing to exactly that demographic, it wins elections. But it sure doesn't make these countries better, more understanding and compassionate places to live in. And it's hardly surprising it doesn't work in war zones such as Iraq and Afghanistan. Perhaps if someone started thinking in terms other than creating and winning conflict? With the greatest respect, Robert, praying won't help. Iraq was at some kind of peace when Saddam ran it, ditto Syria under their dictator and Egypt under theirs. Surely there is a lesson in that about the foolishness of trying to impose democracy on primitives. 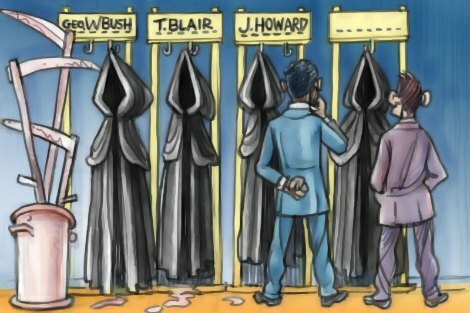 It occurs to me too how unfortunate Australia was that JH was in the US for 9/11 and now TA was there when ISIS came to world attention. How unlucky can a country get! I think Donna and everyone else is correct: the same sort of foreign intervention as in 2003 would be disastrous for Iraq and her people. Ahmed Rashid, the renowned commentator on radical Islam and the Islamic World, is terrified that the achievement of ISIS's stated aim of marching to Karbala and Najaf in southern Iraq, to massacre all Shiites and destroy their shrines, would set the region alight. I am glad the Grand Ayatollah Ali al-Sistani, a revered figure in the country, has spoken out against the corrupt and nepotistic kleptocracy of al-Maliki and in favour of a national government which treats all Iraqis equally. I think it is time for the Sunni ulema to do similar. For safety reasons these may need to be Sunni ulema outside the country. I still think it is too late to save Iraq from partition. The notorious Muqtada al-Sadr is mustering his Shiite followers to clash with ISIS. If that conflict can be prevented it will be a godsend for all Iraqis. Frank: "praying won't help".....Prayer of petition, which is usually trying to tell God to run the universe according to our ideas won't work, but raising the mind and heart to be in tune with God can. It is better to light one candle than to curse the darkness." If enough people do it, , the world will become a better place..